Background: Selection criteria for Special Operations Forces (SOF) physicians are often unclear to potential candidates without prior SOF experience. To date, no published career resource exists to guide the careers of physicians interested in becoming a SOF surgeon. Using a survey tool, desirable characteristics and personal attributes were identified that can be used to inform candidate career decisions and better prepare them for a future position in Special Operations. 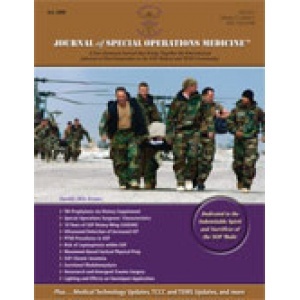 Methods: A descriptive, cross-sectional survey instrument was developed and distributed to current Army SOF Command Surgeons for further distribution to subordinate surgeons. Results were analyzed as a cohort and by subordinate command. Results: Respondents consisted of current SOF Surgeons. Uniformly, the individual characteristics most strongly desired are professionalism, being a team player, and leadership. Possessing or obtaining Airborne and Flight Surgeon qualifications prior to consideration for a surgeon position was highly desired. Residency training within Family Medicine or Emergency Medicine constituted the vast majority of specialty preference. Conclusions: Understanding which characteristics and attributes are desirable to current surgeons and commanders can aid physicians interested in SOF surgeon positions. Using this study and future studies can guide career planning and foster the selection of ideally trained physicians who will operate at the tip of the spear. The views expressed are those of the author(s) and do not reflect the official policy of the Department of the Army, the Department of Defense or the U.S. Government.